Sherrie Scraps with passion: Enjoy the magic of the moment and some Exciting News!! Enjoy the magic of the moment and some Exciting News!! Happy Sunday all!! I hope your enjoying your day! Wow, was out weather amazing yesterday. The temps were in the mid 40's. That is crazy for this time of year-but hey.... I am lovin' it!! Speaking of challenges: Go Fish has one going on right now....Here is the challenge:) You still have about a week to join in. So, come on....go check out the details HERE and come play along:) LOVE to see what you create!!! 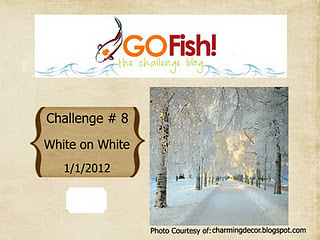 I have a card to share with you today with this challenge in mind. My card base is 5 1/4 x 5 1/4. I cut the white doily shape at 5" from the Art Philosophy cartridge and then embossed it with the polka dots folder. The skate is cut at 3 1/2 plus the layers from the Winter Woodland cartridge, embossed with the spots and dots folder and distressed a bit with SU-Sahara sand. I used 3Girl JAM ribbon-Antique White for the double bow, some bling and cute little pom poms to dress it up. I also added a touch of silver floss and pretty ribbon trimming from Tim Holtz. Isn't that trimming gorgeous? The cute sentiment-Enjoy the magic of the moment is from the Whimsical Fun-Vol 1 set which I won from Stephanie at Whimsical Designs. Thanks Stephanie! Love this set:) The die, curly label is from My Creative Time. What a stunning card--and congrats to you!! Love the card...so beautiful and elegant! Beautiful Card. I am so excited to have you as part of the Team. I've always admired your beautiful creations. Can't wait to work with you. Congratulations Sherrie! That is so exciting, and this card is so beautiful! I love it. Go Fish certainly has good taste in choosing designers! Congrats! I love your card. It is absolutely beautiful! Can't wait to see your projects for Go Fish! Your white on white ice skating card is bee-utiful. Especially like the added pom poms & ribbon. This is just breathtaking. Love all the beautiful embellishments. Thanks cor playing along at BBTB2. Congratulations Sherrie! Love your beautiful card.Love the white on white with all it's fabulous embossing and that great trim. Beautiful, beautiful card Sherrie! I just love the white on white with the touch of silver...stunning! Congrats on the new DT position, I know your work with them will be amazing! Wow Sherrie!! This card is gorgeous! I love all the trims & pom poms - so much detail! Oh Sherrie, this card is stunning! I love the white and silver color palette with the soft white details. Thank you so much for sharing with us at BBTB2. Such a beautiful take on the ice skate challege cut! Whoops, I hit publish before I was done, LOL! Congratulations on the DT!!! That's so exciting! Sherri, I just adore this card!!! It's beautiful!!!! We're still having great weather here too -- so unbelievable in January, in Chicago!!! Congratulations on your DT spot! Of course, I'll be admiring all your wonderful DT projects! Congratulations, You are going to do a great job!! I look forward to seeing what you create. Congrats on your new position, so exciting!! Well deserved. I will have to check out the challenge. This card is absolutely stunning!! Wow, just gorgeous!! Your work is amazing!! OH wow! Sherrie this card is beautiful! I just love all of the embossing and the white on white is positively perfect! It's always hard to pull off White on White, but you did it fabulously! And, Congrats on the DT, Well deserved they are lucky to have your talent! This is gorgeous!! All that embossing really sets your card off, and the trim at the bottom looks great. Congrats on your new DT assignment!! Congrats on your design Team gig!! Your card is absolutely beautiful! Hey Sherrie! The weather is crazy here too, almost 70 today! LOVE this card and congrats on another design team!! How fun for you!! And this card is absolutely gorgeous, looking forward to seeing what you will create!! Congrats Sherrie! Can't wait to see your inspiration projects! Love this card! It is so pretty! Love all the trim and details! Wow, such a beautiful card! I love all your pretty elements. Congrats on the design team, how fun!!!! Great job on the card Sherri, Love the flowers at the bottom and all the embossing. Congrats my friend on your DT spot and I'll see you there I love their challenges. Love your beautiful card, too! What a beautiful card...very elegant. Thanks for joining us at BBTB2. Sherrie, your card is gorgeous! I love the antique white on white and your skate looks fabulous with the little eyelets. Great job with all the wonderful, wonderful details! Oh dear GOSH is this stunning. White on white is one of my favorite things and this is seriously the most exquisite card I've seen of that nature. Truly. The pom poms, the gorgeous ribbon, a plethora of embossing.. and the perfect touch of silver beneath the skate. And of course the bling! Oh gosh. I feel ridiculous that I just don't know what else to say to tell you how much I love this. :o) It is truly a perfect winter card and I cannot stop staring at it. Oh my goodness, this is just about the most beautiful card I have ever seen!! It is so pretty, I just don't know what to say. GORGEOUS.